Yogacharya Bellur Krishnamacharya Sundararaja (B.K.S.) Iyengar (1918 – 2014) began his yoga practice in 1934 under his renowned brother-in-law, the yogi T. Krishnamacharya. 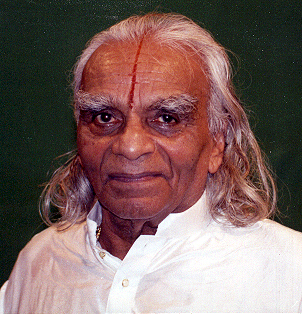 Iyengar continued to practice several hours daily until his death at age 95. Although officially retired for many years, he continued to give selflessly and freely to his students what he gained through personal practice. BKS Iyengar’s innovations in practice and teaching have defined yoga worldwide in the latter half of the twentieth century. Through his poetic and deeply sensitive teaching, Mr. Iyengar validated the practice of yoga asana – through which all the limbs of Patanjali’s ashtanga (8-limb) yoga, and even the principles of Vedanta could be accessed. He introduced props such as sticky mats, bricks, ropes, and chairs to make learning accessible to all. He redefined medical yoga, achieving results beyond the grasp of physicians through a combination of Eastern and Western principles. He became a philanthropist, donating a grade school, an ambulance and a yoga school, along with an endowment to his rural village of Bellur. For information, see www.bksiyengar.com. Of his many honors and awards, one of the most well known was his inclusion in 2004 by Time Magazine in its 100 Most Influential People: Heroes & Icons. Just before his death he was awarded the prestigious Padma Vibushan award by the Government of India, the nation’s second highest civilian honor, and the only yogi so honored.